On Saturday, the Huskers wrapped up spring ball with a 24-13 Red team win in the annual Red-White game. Now we enter the long crawl to August when the 2019 season officially begins. Several high-profile Huskers are set to arrive in the fall — JUCO running back Dedrick Mills, freshman offensive tackle Bryce Benhart — and there’s still fall camp to work through, so there are almost definitely going to be some changes to the Huskers’ depth chart between now and Aug. 31, but here’s how the Hail Varsity staff thinks things will look for that first game against South Alabama. Some questions before we move to defense. . .
What’s your biggest takeaway from the spring and spring game? BV: There’s some work to do at running back and wide receiver. Running back is perhaps obvious. If a team doesn’t have its top three or maybe even four backs in camp, it should be noticeable. But wide receiver? That's worth watching. While I didn’t expect Nebraska to come out of spring ball settled at that spot by any means, I had thought they might be a little closer and I’m not sure that’s the case. That’s a bigger question for me than running back. Continuity in the passing game matters a lot and outside of JD Spielman and Jack Stoll, Nebraska doesn’t have a ton. ES: There is depth in key places on this team, and a lack of depth in others. Nebraska’s quarterback position has depth for the first time in a long time (and we’ll get to that below). The defensive line also has depth (and serious size). Running back, on the other hand, doesn’t have the depth it once had (and may have again come fall). Overall, I think I was just pleased to hear about the depth that is building on this team. It’s refreshing. GS: For me, it’s that there are legitimate reasons for fans to be optimistic about what the defense could be in 2019. Since this staff arrived, all we have talked about is the defense needing to be “just good enough.” Now after a spring of coaches talking about the progress for the Blackshirts and some flashes of good play in the spring game, you can see a path to that unit being better this season. JP: On the flip side of Greg’s answer, and taking into account Brandon’s answer, the offense still has a long way to go, which is surprising and perhaps even somewhat troubling for a Scott Frost team. The defense is looking strong, sure, but when this program is up and running the way Frost wants it to, the offense is going to lead the way. Through a combination of injury and other circumstances that have kept players out, youth and inexperience in multiple spots and a lack of apparent progression in others, this offense isn’t anywhere near ready to go. There are legitimate questions at offensive line, wide receiver and running back, which is 60 percent of the position groups on that side of the ball. That is not ideal. They’ve got the most important part – the quarterback – but he needs a running game to keep defenses honest, an offensive line to protect him and more than one receiver to catch the ball. DP: I think the biggest takeaway has to be that Nebraska is on track. Not ahead. Coaches were very careful to not feed into the UCF timeline this spring, but I think Nebraska is on track for what it wants to accomplish this fall. And not a finished product, but in a reasonably good spot. Nebraska’s defense had a strong spring. Frost said after the spring game when that has been the case, the offense has been strong in the fall. Nebraska has quarterback depth and tight end depth and defensive line depth and there are guys starting to emerge at wideout and safety. I had questions about the offensive line but it seems like that top group is set coming out of the spring, meaning they can spend all summer and fall jelling. Most important, I think, was the praise from the staff throughout spring ball that the team had the right mindset day in and day out. The approach was what the staff wanted. The intensity was where the staff wanted it. There were very few, if any, setbacks this spring. Which position group do you feel worst about? BV: Kind of has to be receiver for me based on the above. There’s potential with some guys, but this offense is best when it can let the offense work for it and that means going to whichever receiver the defense inevitably can’t or doesn’t cover. (Seriously, there always seems to be a guy running open.) Adrian Martinez can pick that guy out, but I just need to see a little more before feeling great that whoever that guy is will make the play most of the time. I don’t know if you can say that with confidence with what we’ve seen so far. ES: Running back, for now. With the departure of Devine Ozigbo and the question marks surrounding Maurice Washington, it’s just a tough group to get a handle on right now. We’ve talked a lot about the three running backs set to arrive this summer, and that helps. But there are just so many questions marks right now. Derek gets into it a little more below, so I’ll keep this short as not to bog you all down with the same topic twice. But yeah, running backs coach Ryan Held has his work cut out for him between now and Aug. 31. GS: Wide receiver and it’s not particularly close. My problem is that I believe JD Spielman and Wan’Dale Robinson are very good. They both have All-Big Ten potential but one has missed games with injury and the other is a freshman making it hard to fully believe. Beyond them there are a whole lot of question marks. Intriguing players with tools, yes. Consistent players the coaching staff can rely on is a different story. JP: JD Spielman’s existence and Maurice Washington’s status being up in the air is the tiebreaker for me between wide receiver and running back. Adrian Martinez is a dynamic runner but relying on him to be your main threat on the ground is not ideal. Nebraska needs a consistent running attack from the backfield and it’s hard to expect that right now with the status of that room. DP: I don’t necessarily feel terrible about this group, but more uneasy. Relying on two scholarship running backs to come in this fall and be two of the top three guys feels risky to me. It feels risky in a normal offense, but with this playbook? I hope Dedrick Mills and Rahmir Johnson have been doing their homework (Ryan Held says they have the playbook and he talks with the incoming guys frequently). I also don’t think Maurice Washington can just go from the spring he had to an instant starter in the fall. Washington is by no means a finished product. He had things he needed to work on this spring. Remember, Devine Ozigbo’s 1,000-yard season was built with an entire offseason of grinding. I have more questions about this group than I do any other. Are you concerned about Jaylin Bradley and Jaevon McQuitty’s apparent lack of jump? BV: Doesn’t seem to be a ton of momentum for either of them. That’s a bit troubling after what set up as an important spring for both of them. ES: If I had to be worried about one more than the other, it’d be Bradley only because they really need that help at running back. He seems to have had a good spring though, so that’s promising. Considering my concern at running back though (as highlighted above), he needs to take whatever he did this spring and amplify it by 100 heading into fall. As for McQuitty, I don’t really know what to say about him. Take from that what you will. GS: Yeah, I’m concerned about both of them. Neither are guys that are brought up unsolicited by the coaching staff in interview settings. We all know they had huge opportunities this spring. 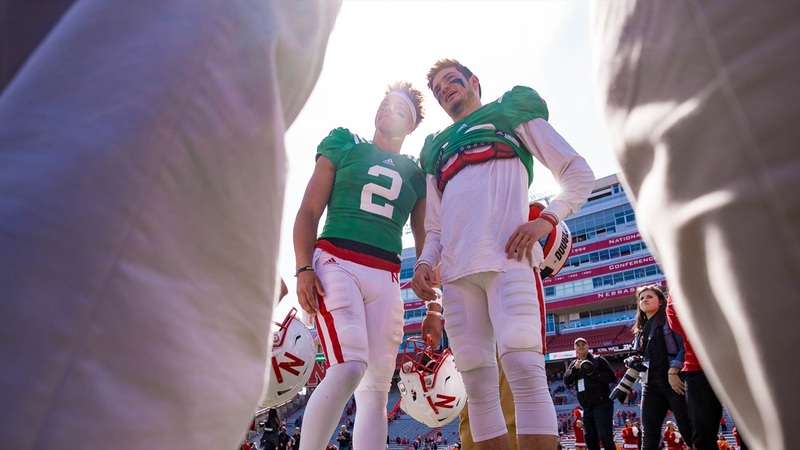 It feels like neither of them will be in the mix at Nebraska this fall. JP: I’m still not entirely sure what is going on with Jaylin Bradley. I thought he played really well on Saturday, especially considering who he was playing with and against. He needs to catch the ball better than he did in the spring game, but he showed some real pop in the run game and was looking a lot more like the guy I saw set records at Bellevue West. Ryan Held has talked about some technique and decision-making inconsistencies that have held him back (running too high, dancing too much, etc. ); perhaps he just needs more time. He’s clearly got some talent. As for McQuitty, perhaps he needs more time as well. He only had one target in the spring game but he caught it for 12 yards on third-and-10, moving the chains with Dicaprio Bootle in coverage. He’s still only a redshirt sophomore, and it doesn’t seem like anybody in that wide receiver room outside of JD Spielman is really separating himself. Everyone on staff agreed Barret Pickering and Isaac Armstrong will be the Huskers’ two starting specialists at kicker and punter. Which position group do you feel best about leaving spring? BV: Close race for me between quarterback and defensive line, but if you go three deep at quarterback you’re still landing on a walk-on. Do the same at any spot on the defensive line and you’re landing on a scholarship player, so the depth is a little better but I also like the talent level there across the board. ES: Quarterback feels like a safe answer, but it’s true. There’s depth there now (which Brandon wrote about post-spring game). I was also telling Derek about Nebraska versus Iowa in 2016. Tommy Armstrong started, despite a hamstring essentially being held together by tape and a weird contraption. Ryker Fyfe then came in but he’d broken his non-throwing wrist the week before and really couldn’t play until it was a moot point late in the fourth quarter anyway. Tanner Lee was on the team, but he had to sit out that season due to NCAA transfer rules. Patrick O’Brien was on the team too, but they really didn’t want to burn his redshirt at that point. But that was it. Four quarterbacks (and technically a former in wide receiver Zack Darlington, who was pretty much not safe to go under center after his concussions). I remember that brutally cold day in Iowa City feeling... helpless? What could Nebraska do? There was no quarterback depth. One injury (or two) and the whole thing unraveled faster than it should have. Anyway, this isn’t a story about the past but to say you should read the story I linked by Brandon above. Nebraska has quarterback depth now. That’s good. GS: It is a popular answer but the defensive line is the pick for me. The group looks much better physically. I feel good about the coaching they are getting from new defensive line coach Tony Tuioti. I also believe in his “Stop the run first” mentality and how that will mesh in the Big Ten. The group is deep and experienced. It’s hard not to feel good about them. JP: I'm excited about the defensive line, but for the sake of being different I’ll touch on the tight ends and their involvement in the offense here. Nebraska’s top tight end didn’t even play in the spring game, but Jack Stoll should be just fine when the season rolls around. Between the two teams, the tight ends drew a total of 13 targets. The conversion rate wasn’t great (they caught just five of those targets), but Saturday wasn’t necessarily set up for great offensive efficiency. However, the fact that getting the tight ends involved was a focus is a good sign and I think Austin Allen showed some real flashes as a receiver down the field. That 6-foot-8 frame is going to be valuable to this offense if he continues to make the route-running progress Sean Beckton has talked about. DP: I think I’m going to go with the defensive line. Darrion Daniels looked impressive in the spring game. Young guys like Casey Rogers and Deontre Thomas have bulked up significantly. Ben Stille is coming into his own. Damion Daniels doesn’t have to be the guy in the middle and I think that will benefit him greatly (he can ball out for four plays then get a break, as opposed to having to be the main snap-getter). The Davis brothers are a known commodity at this point. Everyone got bigger, which is the big thing. Standing on the sideline ahead of the spring game, watching DaiShon Neal and Darrion Daniels go through some warm-ups, I was thinking, “These guys look much more like a Big Ten defensive line.” That’s as big a compliment we can give coming out of the spring. Which individual player best used the spring to set themselves up for a strong fall? BV: Based on the spring game, I’m going with JoJo Domann. He’s gotten rave reviews from people on the team and off. Alex Davis looked as good as he looked, too, but the fact that he and Tyrin Ferguson were splitting reps on the same side, however, said a lot to me about Domann. ES: I need to move my answers below Derek’s so I can just say, “Same.” I was between Brody Belt (Millard West!) and Cam Taylor, but have to give the nod to Taylor. He’s really evolved over the last year. He still has his bigger than life personality that is part goofball and part serious, but he’s just perfected his leadership skills and become the guy who can do just about whatever is asked of him. Anyway, read what Derek says below because... Same. GS: Darrion Daniels. He looks to have the nose tackle spot locked down. Daniels could also prove to be much more than a positive locker room influence who can give you snaps here and there. If he can become a force in the middle, it changes the complexion of the defense. He is in prime position to do that. JP: JoJo Domann, Cam Taylor, Darrion Daniels Alex Davis are all really good answers. Once again, however, I’ll take a different route for the sake of variety and say Cam Jurgens. I think he’s still probably got a long way to go before he’s ready to start in a real game, but the coaches seem determined to fast-track his development at his new position and he certainly showed some flashes in the spring game of why they are so excited about him at that spot. Every rep is valuable for a guy learning his position and Jurgens got a lot of first-team reps this spring. DP: Brody Belt had a really good spring, but I think my answer is Cam Taylor. The sophomore corner, who sits behind two veteran corners on the depth chart, is a team leader and a player the coaching staff desperately wants on the football field. So much so, he has taken safety reps in practice. Remember, this guy was playing quarterback two years ago. I think Taylor has played himself into a utility role in the defense this spring, a guy who plays nickel, a guy who spells at safety and corner, and a guy who apparently is going to factor into the return game.